Travelers look for detailed dining information. Introduce your members to new technology for use on their own websites. No upfront development or investment required, simple implementation. Licensing model tailored to individual requirements. menumodo is a reliable partner, helping us provide enhanced services for our members. Using menumodo, our hotels and restaurants can manage their menus easily and the results are like magic: up to date menus on their websites and on relaischateaux.com. menumodo is easy to use and quick to implement on their websites, and our visitors are happy to view all menus easily and in one place. 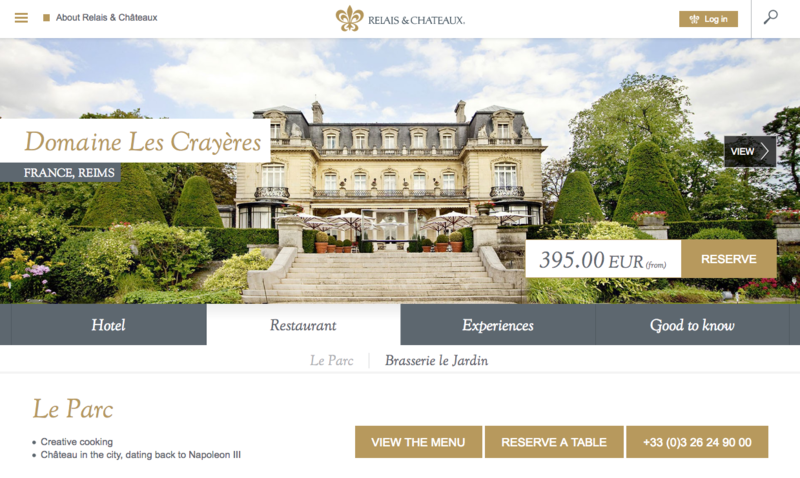 Menus, managed by the properties, are displayed on the Relais & Châteaux website property pages, ensuring the current menus are shown. The display is customized to the website design. Properties can also use the menus on their own websites. For example Domaine Les Crayères, Reims, France. menumodo is a win-win for Representation Companies!